During the Coast to Coaster promotion at the LC, they brought in a bunch of beers that were never available in Manitoba before. Some of the beers were average, others were amazing. Some were incredibly expensive. 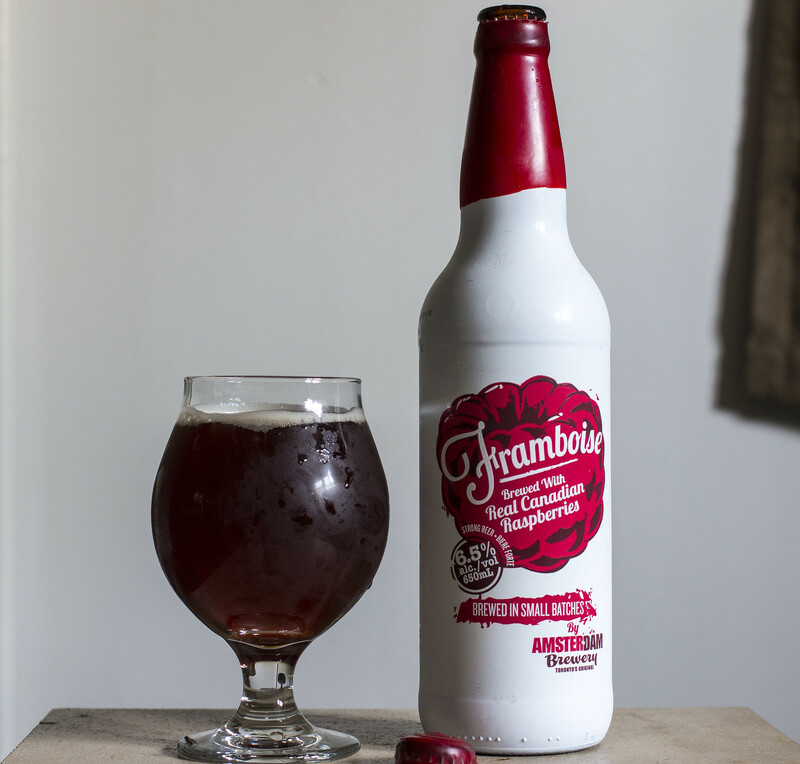 Amsterdam's Framboise Fruit Beer was one of the most expensive beers as part of the promotion at $11.99 for a 650mL bottle. Eventually, the LC had a clearance event to get rid of all the remaining Coast to Coaster beers, so I was able to purchase a bottle of Framboise for under $10. I'm broke, so I don't have the money to waste money on beer willy-nilly.. especially after spending $20 on a bottle of Rogue's Sriracha beer, I will never purchase another Rogue beer as their beer is simply highway robbery. Hell, in Ontario.. it was selling for nearly $8 less per bottle! I'm willing to pay $20 for an amazing tasting beer, but for a Rogue, hell no. But this is about Amsterdam's Framboise, not Rogue. Amsterdam's beers are fairly consistent and tasty, so I haven't really had a bad beer from them, so paying $9-10 for a clearance of their Framboise is better than $11.99.. especially if it turns out to be good. Apperance: The Framboise pours a dark brown ale, reminiscent to a Belgian-style dubbel in some aspects. There's a nice cherry red hue to it and it has a decent amount of cookie dough yellowish/beige head on top. Aroma: Well, this certainly IS a framboise! The first notes I got when opening up the beer was raspberries, lots of raspberries! A sweet, jam-like raspberry aroma, quite sugary and fruity. The raspberry notes are more humble and natural than a lot of raspberry beers I've tried, not a syrupy corn syrup concoction.. thankfully. A bit of a gritty wheatiness in there and a hint of a leafiness that I can only describe as fruit bush leaves. Taste: Light to mildly tart and bitter, there's a bit of a bitter nuttiness that reminds me of a few Belgian-style dubbels I've had, fairly bitter. Decent amount of tartness but not to the point of sours/kriek/etc styles. Mild sweetness of raspberries and raspberry jam, but I feel that it's not the main element of the beer like we saw in the aroma. It's a bit complex, a bit darker and especially quite a bit earthier.